Learn to fly in New Zealand. Dreaming of flying yourself over one of the most beautiful places on earth? Or maybe even dreaming of learning to fly during your winter vacation in a mild climate far away from snow and cold weather? 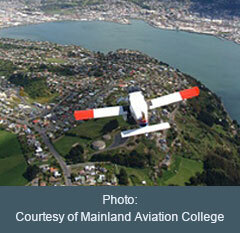 Mainland Aviation College (www.mainlandaviationcollege.com) located among the most stunning sceneries in the South Island of New Zealand at a latitude of 45∘ 52′ S can offer you all the above and a lot more. Mountain Flying Training: If you have already a pilot license and are short of time you can still enjoy mountain flying training with highly experienced instructors among the Southern Alps, one of the most mountainous terrain in the world. Private Pilot License in New Zealand with Ground Training in Germany: You can cover the theoretical knowledge in Germany (including radio communications in English) with an experienced FAA instructor, take your written test in New Zealand and be ready for the practical flight training shortly after arriving. Advanced Licenses and Ratings: Commercial Pilot License, Instrument Rating, Multi Engine Rating at a school which - as a division of Mainland Air Service - can provide a professional commercial-oriented training from the very beginning. Assistance with housing and transportation is provided. Assistance in the organization of flights from Europe can be provided as well. Dunedin (Nickname Edinburgh of the South) is a fascinating town with a vibrating cultural life, home to the University of Otago, New Zealand’s first university (1869), and the Otago Polytechnic . Dunedin is also home to several colonies of penguins, seals and even Royal Albatross: Indeed, an interesting combination of science, culture and nature, which guarantees multiple possibilities for your spare time. Practical organization of your stay in New Zealand in all details through a direct connection with the flight school. Professional help for your ground and flight training: Take some introductory lessons, learn the basic principles of flying directly in Aviation English, train in Aviation English with an experienced FAA instructor in Germany.